Are you looking for professional yet cheap online printing and design services in Canada? Do you need high quality and customized business cards, flyers, brochures, postcards, or catalogs for your business? You have come to the right place! Copycave Inc. is your trusted online printing service company in Canada. Our team of experts have the experience and skills to help you find the right solution for all your printing needs. Whether you want to have your own business cards, brochures, postcards or need professional yet cheap graphic design services in Canada, Copycave Inc. has all of the resources and skills required to take your printing project to the next level. No matter what your project requirements, size or budget, Copycave Inc. has all of your online printing needs covered. We offer a wide selection of online printing products and services at affordable prices. We are proud to serve businesses and individuals in Canada and also ship orders to United States. All orders are billed in Canadian dollars. We strive to bring you the best possible prices in Canada for premium quality business cards, brochures, additional printing products and other online services while offering a much higher level of friendly customer service and quality control than you would expect at most local print shops. ✓ Online Printing Canada - Low cost delivery to all Canadian cities! We can help save you money on your print orders regardless of where you are located. This can be especially beneficial for businesses with multiple offices located across Canada or the U.S., that are looking for consistent standards for their business cards, brochures and other printing material at the best possible rates. In addition to our cheap prices, we are also proud to offer fastest turnaround times in the industry. Regardless of where you are located in Canada, we deliver your order fast and save you money. Our high product quality, helpful online customer service, and rock bottom pricing keep our customers coming back. We offer premium quality printing products with a wide variety of high quality materials and folding techniques. Whether you are providing your own designs, or you want our experts to create it for you, we can help take your ideas and bring them to life! Select the product you are interested in. We offer a wide variety of products and if you require a custom job feel free to contact us and we'll do our best to take care of your request! Most products have three options. Upload your own design file, browse our library of free professionally designed templates, or create your own custom design! 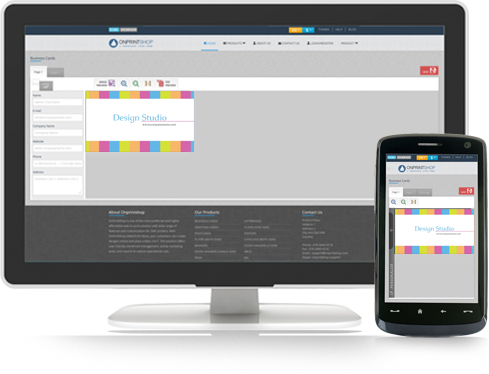 Our online design application is powerful and easy to use. Once your order has been completed it will be shipped directly to you via UPS. For example, to print Calgary standard business cards the estimated time to receive your order would be 5-6 business days with standard shipping. Delivery time to most Canadian cities is only 1-3 business days via UPS Standard. 13oz matte vinyl banner printing, great for indoor or outdoor use. Plastic business cards printed in full CMYK colour. Waterproof, durable, and great looking. Stickers printed on premium 70lb badgestock and coated in UV Gloss. Door hangers printed in full colour on extra heavy stock with your choice of 3 die-cut styles. Flyers printed in full colour, high definition, and on premium 100lb Gloss Book (150GSM) stock with coating options available. A FRESH new way to order your printing! We provide high quality and cheap online printing services to thousands of businesses across Canada and are growing rapidly thanks to our loyal customers, keep spreading the word! If you would like to see our product quality first hand prior to ordering please request a free sample pack and we'll have one in the mail for you the following business day. To learn more about our business cards, flyers, brochures and other products and services online, and if you need assistance at any time, please contact us via telephone toll free at 1 (855) 321-2283 or use our live chat.